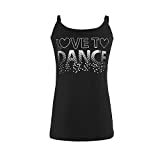 Girls' vest top with silver foil Love To Dance logo and diamante detail..
Fabulous spaghetti strap vest top with added elastane for a comfy fit. Ideal worn with shorts or leggings. Great for layering. Perfect to wear to dance classes, on holiday or simply relaxing. Brande new in sealed bags with tags and labels attached. Pineapple girls double layer crop top ideal for dance, gym, acro etc. Pink racerback style top layer with contrasting silver logos across the front. The black sewn in underlayer has camisole straps and sits fairly high at the front for comfort and modesty. The deep underbust band helps offer a secure and comfortable fit and features DANCE in a white print. Comfortable stretch fabric: 95% cotton, 5% elastane. 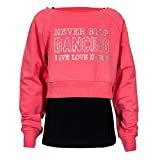 Girls Love To Dance & Live Love Dance crop sweatshirt and vest combo. Perfect for your Saturday dance class. Featuring silver foil/diamante Love To Dance & Live Love Dance print across the chest. Please note that we recommend washing separately due to the different colours. Sweatshirt has a lovely soft fleece lining. Genuine Brody & Co girls dance pants. Perfect for your Saturday dance class. Fabulous fold over waist band with an elasticated 'Love To Dance' inner band. 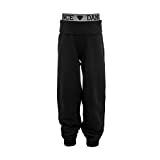 Elasticated roll up cuff bottoms with a super soft fleece lining and a lovely brushed cotton finish. Super comfy to wear all day long - style with your favourite crop jumper or tees and you're good to go! These stunning full length leggings from Pineapple are a girls wardrobe essential, ideal for dance and perfect for everyday casual wear too. Full length Black leggings with an elasticated waistband, featuring DANCE printed in diamante studs on the right leg and a Silver Foil "Pineapple" logo on the left hip. Great quality, cotton rich, stretch fabric, gives a supportive and comfortable fit whilst the gentle stretch ensures an easy pull-on. Girls dance inspired Pineapple full length leggings in black with contrast pink panels. The elasticated waistband is embellished with "pineapple" in a silver foil print. The leggings feature eye catching silver diamante studs on the pink contast leg panels. 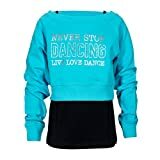 NEW ARRIVAL*...Girls Love To Dance hooded sweatshirt. Perfect for your Saturday dance class. Featuring an eye catching silver foil/diamante Love To Dance print across the back. Long raglan sleeve with handy pouch pocket on the front. Made from our finest, soft bushed cotton. Making it super soft and comfy on the skin. This dance inspired girls Pineapple long sleeved hoodie is available in PINK, a relaxed fit with raglan sleeves and ribbed cuffs. Raw unfinished cropped hemline. Featuring a bold Pineapple logo print in silver foil across the front hemline.